I just realized that I forgot to show off this lovely finished chevron quilt - I love the quilting that was done by my friend Marie from Blueberry Hill Quilts in Chestermere, Alberta. I love the way a quilt looks hanging outside on the railing! And the background of the green grass just makes the yellow pop! The batting is an 80/20 cotton/poly blend and it has a nice amount of loft. 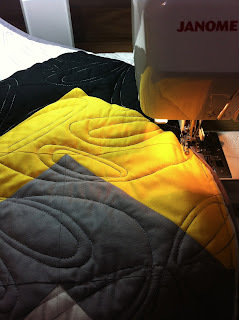 I like the way the way the quilting gives this quilt depth and texture - a nice contrast to the graphic pattern and solid colors! Free Ebook with MY Quilt Pattern!